In 1939, Timely Comics, the precursor to modern Marvel, burst onto the scene with a wild and unmatched energy, populating the Golden Age of Comics with hundreds of all-new characters! CBI - China: Day 142 of 142 of the 1st Battle of Hebei. The battle sort of ends as the Chinese and Japanese begin negotiating for a truce. Spain: Day 310 of 985 of the Spanish Civil War. Spain: Day 675 of 985 of the Spanish Civil War. CBI - China: Day 320 of 2,987 of the 2nd Sino-Japanese War. Day 105 of 124 of the Battle of Henan. Europe: Italy and Germany sign the "Pact of Steel" which is a ten-year military alliance. CBI - China: Day 685 of 2,987 of the 2nd Sino-Japanese War. Day 33 of 35 of the Battle of Suizao. CBI - Mongolia: Day 12 of 129 of the Battle of Khalkhin Gol, a border dispute between the Soviet Union and Japan. UK: British cryptologists in Bletchley Park break the Luftwaffe Enigma code. UK: The United Kingdom passes the Emergency Powers (Defense) Act, giving the government authority over persons and property for the duration of the war. Two offenses under the regulations were punishable by death. ETO - Norway: Day 44 of 63 of the Battle of Norway. ETO - Belgium: Day 13 of 19 of the Battle of Belgium. ETO - France: Day 13 of 44 of the Battle of France. The German 19th Panzer Korps leaves Abbeville and heads off toward Boulogne, Calais and Dunkirk along the Channel coast. CBI - China: Day 1,051 of 2,987 of the 2nd Sino-Japanese War. Day 190 of 381 of the Battle of South Guangxi. Day 22 of 49 of the Battle of Yichang. Atlantic: German sub U-111 sinks the British ship BARNBY 400 miles southwest of Ireland. Atlantic: The British naval blockade of Vichy France is now complete. Atlantic: German sub U-103 sinks the British tanker GRENADIER 50 miles off Sierra Leone, British West Africa. ETO - Norway: Himmler forms a Norwegian SS organization, modeling it after the German one. MTO - Greece: Day 3 of 13 of the Battle of Crete. Fierce fighting continues as British Commonwealth troops begin to pull back from Maleme airfield toward Suda Bay. The Luftwaffe attacks the Royal Navy off the island of Milos, sinking 3 ships and damaging 4, killing a total of 1,129 men. MTO - Libya: Day 43 of 256 of the Siege of Tobruk. Middle East: Day 21 of 30 of the Anglo-Iraqi War in Iraq. Iraqis counter-attack the British troops at Fallujah with Italian light tanks. East Africa: Day 347 of 537 of Italy's East African campaign in the lands south of Egypt. British troops capture the last Italian stronghold in southern Abyssinia. CBI - China: Day 1,416 of 2,987 of the 2nd Sino-Japanese War. Day 16 of 21 of the Battle of South Shanxi. Yugoslavia: Captured Croatian Anti-Axis partisan commander Stjepan Filipovic is publicly executed by hanging in Valjevo. Defiant to the end, he raises his fists and urges continued resistance against fascism. Stjepan Filipovic was a communist fighting alongside partisans against the Axis forces that had invaded Yugoslavia in 1941. He rose to the "rank" of commander until he was captured on 24 Feb 42. 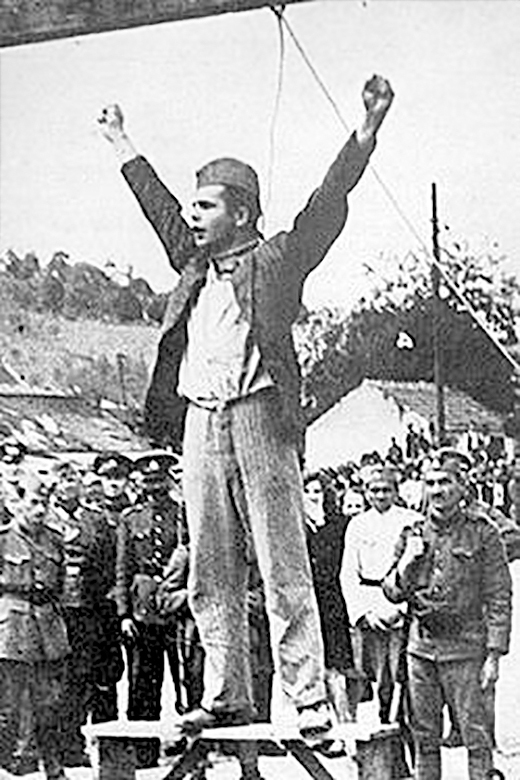 As the rope was put around his neck, Filipovic defiantly thrust his hands out and shouted "Death to fascism, freedom to the people!" As his hands were tied behind his back, he urged the Yugoslav people to resist and implored them to never cease resisting. The photo above would eventually become famous as a symbol of resistance and to honor the heroism of Yugoslavian Partisans during WWII. 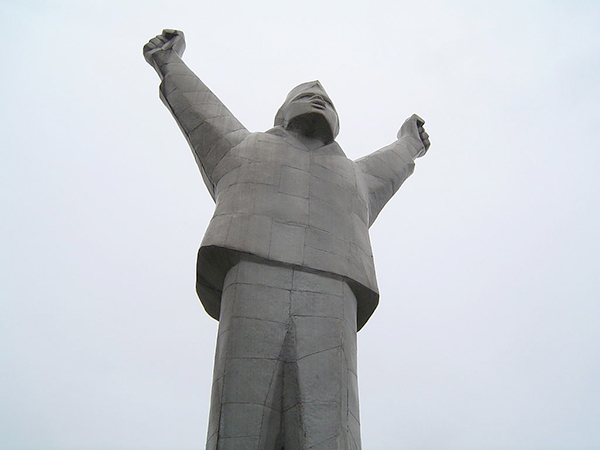 Stjepan Filipovic was declared a National Hero of Yugoslavia on 14 Dec 49. Atlantic: Day 129 of 169 of Germany's Second "Happy Time," during which U-boats sink 609 Allied ships with little risk. Russian Front - North: Day 257 of 872 of the Siege of Leningrad. Russian Front - North: Day 18 of 658 of the Siege of the Kholm Pocket. Russian Front - South: Day 11 of 17 of the 2nd Battle of Kharkov, Ukraine. The Soviets are almost completely surrounded and must fight their way out to avoid capture. Russian Front - South: Day 205 of 248 of the Siege of Sevastopol, Crimean Peninsula. East Africa: Day 18 of 186 of the Battle of Madagascar. CBI - Burma: Day 160 of 164 of Japan's Invasion of Burma. CBI - China: Day 1,781 of 2,987 of the 2nd Sino-Japanese War. Day 8 of 124 of Japan's Zhejiang-Jiangxi Campaign, launched to punish anyone suspected of aiding the Doolittle raiders in China. Roughly 250,000 Chinese will be killed. PTO - Malaya: Day 93 of 357 of the Battle of Timor Island. PTO - New Guinea: US 5th Air Force B-17s pound the airfield at Rabaul while B-26s hit the airfield and harbor at Lae. USA: The film "Mission to Moscow" is released, made at the behest of President Roosevelt to garner more sympathy and support for the Soviet Union. It portrays Stalin's Russia in a very favorable light, so much so that it will be denounced after the war by the House Committee on Un-American Activities. Who was the more evil, murderous, twisted and sadistic, Joseph Stalin or Adolf Hitler? Tough call. But having decided that "the enemy of my enemy is my friend," the Allies made a deal with the devil and joined the Soviets against a common foe. The outcome was not very pleasant for Eastern Europe for decades to come, but at least the Third Reich had been destroyed. But American sentiment toward Stalin's communist dictatorship had not been at all favorable, particularly after Hitler and Stalin carved up Poland and seemed to be enjoying a cozy non-aggression pact. When Germany invaded Russia in 1941, everything changed and Americans needed a change of heart regarding our new allies. Movies were well suited to the task. They could properly evoke sympathy for the plight of the Russian people and even paint a portrait of a despicable Joseph Stalin as a kindly "Uncle Joe." Mission to Moscow presented the far-fetched image of the Soviet Union as a country seeking the American model of democracy. It was nominated for an Academy Award for Best Art Direction-Interior Decoration in a Black-and-White film, but it was not a commercial success, in spite of Warner Brothers' spending $250,000 advertising the film before its release. Review were bad. It was said to be stiffly acted, poorly plotted, padded with stock footage, and just generally clumsy. With the end of World War II, new factors came to define relations between east and west. The fight for ideological power over world territories was launched. Significant parts of Eastern Europe were under the control of communist influence. Post-war events led to the culmination of American-Soviet relations that was fully expressed in the Cold War period of 1947-1991. 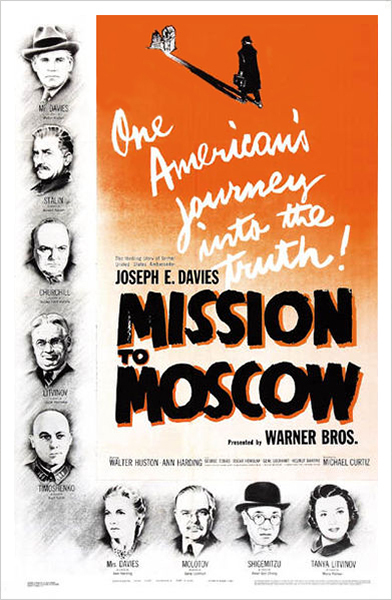 In 1947, the House Committee on Un-American Activities blasted Mission to Moscow for being a Hollywood pro-Soviet film, calling it "unquestionably the most blatant piece of pro-Stalinist propaganda ever offered by the American mass media." The pro-Soviet propaganda of Mission to Moscow is a bit hard to take for those who sit smugly in the light of hindsight. But if you look at the film as document rather than documentary, you will gain an insight into the kind of public mindset called for by the US government at a crucial moment in American history. Atlantic: Aircraft from the USS BOGUE attack the German submarine U-569, forcing her to surface and surrender. Germany: Adolf Hitler previews the ME-262 jet fighter at Lechfeld in Bavaria. He likes the jet and demands it be used as a bomber. Russian Front - North: Day 622 of 872 of the Siege of Leningrad. Russian Front - North: Day 383 of 658 of the Siege of the Kholm Pocket. MTO - Italy: Day 1 of 20 of the naval and aerial bombardment of Pantelleria Island. MTO - Italy: US 12th Air Force RAF Wellingtons bomb four airfields in Sicily. CBI - China: Day 2,146 of 2,987 of the 2nd Sino-Japanese War. Day 11 of 23 of the Battle of West Hubei. PTO - Alaska: Day 350 of 435 of the Battle of Kiska, Aleutian Islands. Day 12 of 20 of the Battle of Attu. Enemy planes make a torpedo attack on the gunboat USS CHARLESTON (PG-51) and destroyer USS PHELPS off Attu. US 11th Air Force provides air support. PTO - New Guinea: Day 31 of 148 of the 2nd Battle of Lae-Salamaua. US 5th and 13th Air Forces provide air support. USA: Life Magazine publishes a "picture of the week" of an American girl with a Japanese skull sent to her by her naval officer boyfriend. The letters that will be received from readers in response to this photo are "overwhelmingly condemnatory" and will prompt measures by the US Military to take action against the mutilation and desecration of enemy corpses. 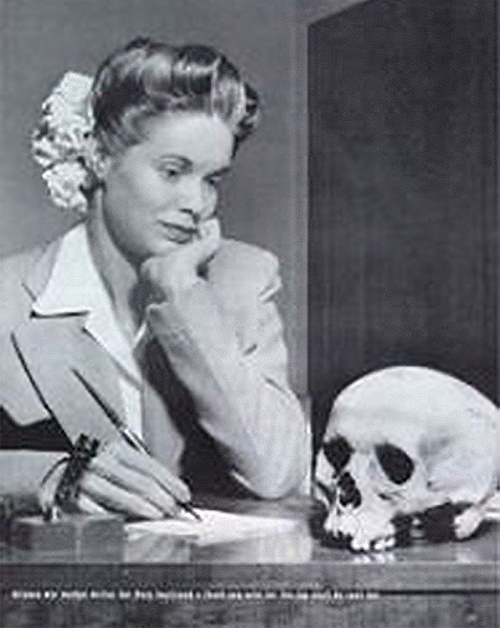 "Arizona war worker writes her Navy boyfriend a thank-you-note for the Jap skull he sent her." The Army directed its Bureau of Public Relations to inform US publishers that "the publication of such stories would be likely to encourage the enemy to take reprisals against American dead and prisoners of war." The junior officer who had sent the skull was also traced and officially reprimanded. This was done reluctantly however, and the punishment was not severe. The Life photo also led to the US Military to take further action against the mutilation of Japanese corpses. In a memorandum dated June 13, 1944, the Army JAG asserted that "such atrocious and brutal policies" in addition to being repugnant also were violations of the laws of war, and recommended the distribution to all commanders of a directive pointing out that "the maltreatment of enemy war dead was a blatant violation of the 1929 Geneva Convention on the sick and wounded, which provided that: After every engagement, the belligerent who remains in possession of the field shall take measures to search for wounded and the dead and to protect them from robbery and ill treatment." Such practices were also in violation of the unwritten customary rules of land warfare and could lead to the death penalty. The Navy JAG mirrored that opinion one week later, and added that "the atrocious conduct of which some US servicemen were guilty could lead to retaliation by the Japanese which would be justified under international law. ETO - France: US 9th Air Force B-26s and A-20s bomb airfields and other targets in the Cherbourg, Calais and Paris areas. ETO - Germany: Future American top scoring fighter Ace Gabby Gabreski shoots down 3 German Fw-190s in a single mission, bringing his record to 22 kills. ETO - Germany: US 8th Air Force: B-17s bomb the port at Kiel. Russian Front - North: Day 111 of 191 of the Battle of the Narva Isthmus, Estonia. Both German and Soviet troops remain in their defensive positions. Russian Front - South: Day 45 of 60 of the Battle of Romania, 1st Jassy Offensive. MTO - Italy: Day 122 of 136 of the Battle of Anzio. RAF and US Air Forces provide air support. Lt Col Francis Gabreski shoots down 3 German FW-190s in one day. CBI - Burma: Day 79 of 166 of the UK's Operation THURSDAY. CBI - Burma: Day 74 of 147 of the Battle of Myitkyina. US 10th Air Force provides air support. CBI - Burma: Day 52 of 302 of the Chinese Salween Offensive. US 14th Air Force provides air support. CBI - China: Day 2,512 of 2,987 of the 2nd Sino-Japanese War. Day 36 of 259 of Japan's Operation ICHI-GO. Day 36 of 39 of the Battle of Central Henan, the first offensive in Japan's Operation ICHI-GO. CBI - India: Day 76 of 118 of the Battle of Imphal-Kohima. PTO: The USS POLLACK attacks a Japanese convoy, sinking the destroyer ASANAGI and damaging a freighter. PTO - Alaska: US 11th Air Force B-25s hit shipping near Paramushiru, sinking a picket boat. PTO - New Guinea: Day 160 of 597 of the Battle of New Britain. US 13th Air Force provides air support. PTO - New Guinea: Day 31 of 481 of the Battle of Western New Guinea. PTO - Solomon Islands: Day 204 of 295 of the Battle of the Bougainville Islands. US 13th Air Force provides air support. UK: The British Government announces further reductions in rations. Bacon is reduced to three ounces per person per week, cooking fat to one ounce and meat to 106-lbs per person per year. The soap ration is also reduced for all but babies and young children. CBI - China: Day 2,877 of 2,987 of the 2nd Sino-Japanese War. Day 52 of 91 of the Battle of Zhijiang. US 14th Air Force provides air support. Japanese troops begin pulling out of China. Day 44 of 60 of the Battle of West Hunan (near Zhijiang). Japanese troops continue withdrawing from southern China. PTO - Dutch East Indies: Day 22 of 52 of the Battle of Tarakan Island. PTO - Japan: Day 52 of 83 of the Battle of Okinawa. Heavy rain puts much of the battle on hold, but US troops manage to take Sugar Loaf Hill. PTO - New Guinea: Day 512 of 597 of the Battle of New Britain. US 10th Air Force provides air support. PTO - New Guinea: Day 396 of 481 of the Battle of Western New Guinea. US 10th Air Force provides air support. PTO - Philippines: Day 214 of 299 of the 2nd Battle of the Philippines, aka the Liberation of the Philippines or the Philippines Campaign. PTO - Philippines: Day 159 of 244 of the Battle of Luzon. 5th Air Force provides air support. PTO - Philippines: Day 74 of 159 of the Battle of Mindanao Island. 5th Air Force provides air support. PTO - Philippines: Day 66 of 135 of the Battle of the Visayas region. US 5th and 7th Air Forces provide air support. The little-explored story of how politics, propaganda, and profits were combined to create the drama, imagery and fantasy that was American film during WWII.